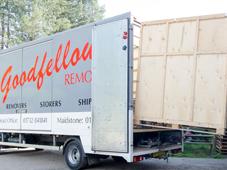 As a family run business for over 30 years, Goodfellows Removals has established itself as the leading domestic and commercial company for storage and removals in Maidstone, West Malling, and throughout Kent. With recent growth over the years, we are now also able to cover overseas removals throughout many European countries. Over the last 3 decades Len and Kim Goodfellow, the owners of Goodfellows Removals & Storage, have built a fantastic reputation with their customers and are well known for the outstanding level of personal customer service that they provide. 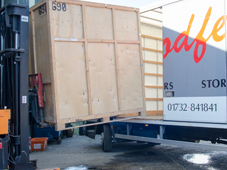 As well as our specialist house removals services, we also offer a range of supplementary services including secure storage, packing and even commercial and international removals. We offer a complete one-stop solution to all your removals needs, so whether you're moving your business to a new office, relocating to a different part of the country, or beginning a new life abroad, we can help you every step of the way. 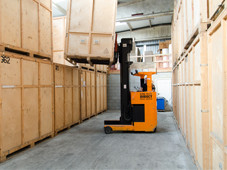 What's more, we can also provide total convenience by storing your possessions in our storage facility located in West Malling, Kent. From your initial contact with us, right up to the actual move itself, we strive to offer a friendly, but always professional house removals service. Our proudest achievement being that we have such a strong relationship with our customers that many of the moves we have undertaken are for people that have moved with us before, or for people who have been recommended by one of our many, happy customers. To get an idea of what our customers think about us, please view our testimonials. For complete peace of mind, we have the best insurance cover on the market. Arranged by our British Association of Removers (BAR) affiliated broker, our insurance cover would provide you with £50,000 with a £25 excess, which can be easily increased if desired. Based in Kent and with offices in Maidstone and West Malling, we're able to service all local and surrounding towns including Maidstone removals, West Malling removals, Sevenoaks removals, Tonbridge removals, Tunbridge Wells removals and more areas throughout Kent. As we've grown over the years, we can now also accommodate overseas removals to many European countries, and we can also move large and fragile items such as antique pianos. Small enough to care but big enough to cope, we can handle your move whatever the situation. We are as personable as we are professional, and our fully trained staff will treat your possessions as though they are their own. Our only goal is your complete satisfaction, and the safe removal, transportation, or storage of your possessions. 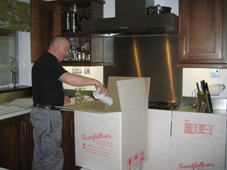 All of our removals staff are employed by us, and will arrive at your home in Goodfellows uniform, and will then work quickly and efficiently to ensure your move goes without a hitch. So if you're looking for a long established local family company with an excellent reputation who can handle any commercial or domestic removals anywhere in the UK or overseas, please call 01732 841841. “Your guys have been outstanding today, a huge credit to your company. I was dreading the move...they have made it stress free and as pleasurable as moving can be. Such good chaps...I could not be happier with them...professional and flawless. "